Coming to our Little Red Dot for the first time, Digital Art Weeks was founded in 2006 by New York-born, Basel-based artist and curator Arthur Clay with a team that he met at the Swiss Federal Institute of Technology (Eidgenössische Technische Hochschule Zurich, or ETH Zurich for short) with the aim of merging the arts with science and technology. The festival is hosted in a different city each year (thus far, it’s been to Shanghai, Basel, Xian and Vancouver), with citywide events ranging from workshops to exhibitions, symposiums and performances involving both local and international talents. This edition is hosted by the Singapore-ETH Centre for Global Environmental Sustainability at NUS, so the main theme is, unsurprisingly, centred on eco-friendliness. Here are four visual art events to catch, all free to see. 7-17 May. This five-part showcase will feature works by artists from Switzerland and Japan. They include the ‘BOLCH Film Compilation’ and a ‘BOLCH print’ – both centred on a two-ton tree trunk, which is making its way around the globe courtesy of Zurich-based art duo Com&Com, to symbolise an old Swiss carnival tradition. Though the tree unfortunately won’t be making an appearance in Singapore, Com&Com will nevertheless recreate a carnival vibe for the setting. Another work is ‘Games & Wonderment’, in which visitors are encouraged to try out by interacting with a series of small works and games created by Swiss art collective Curious Minds. Ichi Ikeda, whose ‘HandFalls’ will be displayed at the ArtScience Museum, is exhibiting his original sketches for the piece here, giving viewers an insight into where the idea came from. Finally, with the help of Curious Minds and Ichi Ikeda, a large ‘Earth Puzzle’ made of hexagonal-shaped paintings created by local kids is also a main attraction. Japan Creative Centre, near Far East Plaza Tue-Sun 10am-6pm. 8 May. A sort of pub crawl across various gallery spaces around town, this one-night event features a range of visual and performance artists from both Singapore and around the world. The night starts at 5pm with exhibitions at Your Mother Gallery (91A Hindoo Rd) and Cups & Canvas Gallery (139 Selegie Rd). Notable artists here include Holger Mohaupt at Your Mother, who will show ‘Outside from Inside Singapore’, a selection of prints and digital displays of photos the German artist took during his week-long residency in Singapore, where he used built environments to frame a landscape. At Cups & Canvas, look out for ‘Chocolatey Sweet Nothings’ and ‘15 Hour Distance’, two series of works by local artist Adeleine Daysor inspired by snippets of Skype conversations she had with her partner: the former shows different shades of a beverage as it settles and changes temperature over time, while the latter depicts elements of a Peranakan home. Various performances from sound artist Miha Ciglar at the Independent Archive & Research Center (67 Aliwal St, 8-9pm) and Jackson 2bears, who will do live video manipulations at Night & Day Bar (139A Selegie Rd, 9pm-midnight), among others, will close out the night. Various locations 5pm-midnight. 8-19 May. 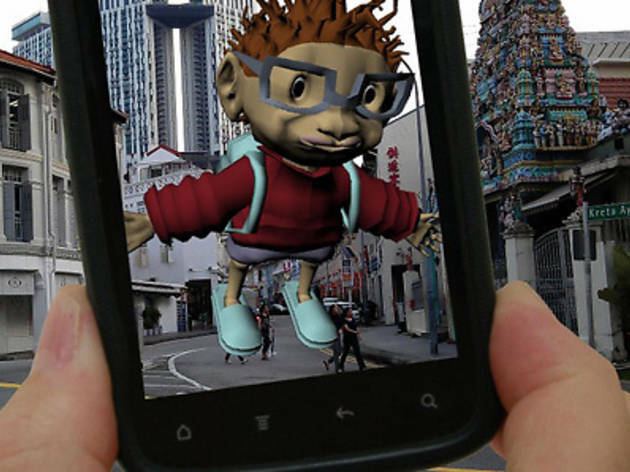 Billed as Singapore’s first augmented reality exhibition – in which viewers look at their surroundings through an app on their phones, allowing them to see added digital elements in the landscape – this virtual exhibition features creations from a number of international new media artists, including the Boston-based John Craig Freeman, who also helped Singapore Polytechnic students develop some of the augmented reality works shown in this exhibition. 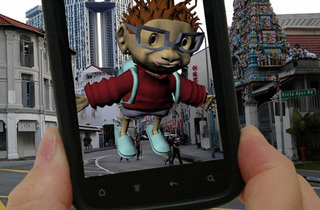 Stretching along Orchard Road and around Clarke Quay – with images of cartoon characters floating past the malls or a new colours on historic buildings – the idea for the interactive exhibition came from DAW founder Clay himself, who was inspired after seeing a photo of Orchard Road through a sticker-plastered car windshield. The app (which can be downloaded from the DAW website) also makes use of geo-tagged media – a common element in video games where the whole experience blurs the line between art and life. Various locations along Orchard Road and Clarke Quay Guided 30-minute tours start from ION Orchard and Central Mall from 10am-10pm; maps for self-guided tours will also be available in hard or soft copies. 10-19 May. Despite working with very different media, pieces by Japanese artist Ichi Ikeda and Swiss-Austrian-American artist duo Ubermorgan.com are both showcased at the ArtScience Museum, united by the festival’s theme (and a focus on the element of water). Ikeda’s piece ‘HandFalls’ features photos of hands and lotus flowers that will be placed in the lily pond outside the museum. By placing a special light source beneath the images and making use of the water’s natural refractive quality, a tranquil and beautiful reflection will be projected onto the building’s exterior. Ubermorgan, on the other hand, will be presenting a collection of digital paintings called ‘Deephorizon’. Based on patterns created by the Gulf of Mexico oil spill in 2010, the works are created by applying compression effects and video-editing to actual images from the disaster, which the artists optimistically referred to as ‘an oil painting on an 80,000-square-mile ocean canvas with 32 million litres of oil – a unique piece of art’. ArtScience Museum 10am-10pm. Digital Art Weeks is on from 6-19 May. Various venues.